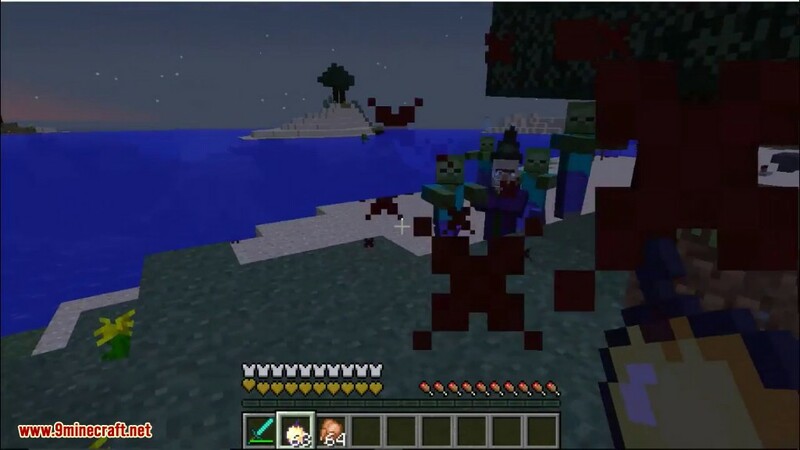 Zombie Awareness Mod 1.12.2/1.11.2 makes Zombies and Skeletons more intelligent. Now they can see you from a much further distance. Doing tasks like mining makes noise that will also increase the chance of them hearing you and coming to attack. They are also attracted to light sources and can attack in groups. 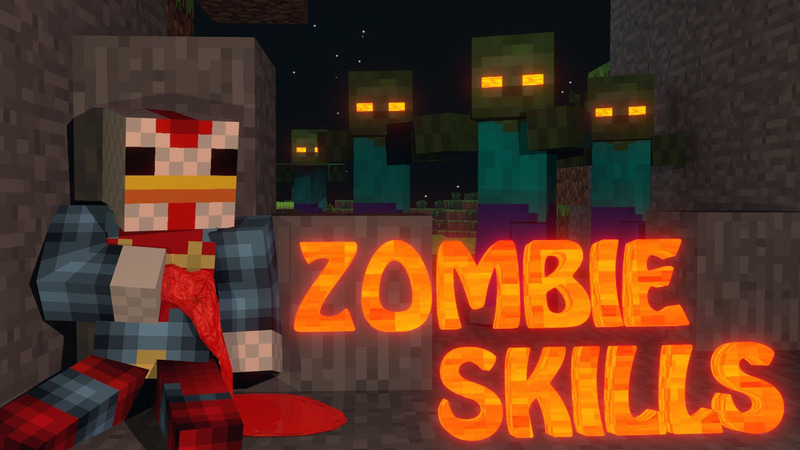 This mod is based around making hostile monsters smarter. It allows them to smell players’ blood that is spilled, hear the players’ activities, and find their light sources. All of these allow them to find players easier. When a player has any health taken away, they may start to bleed. 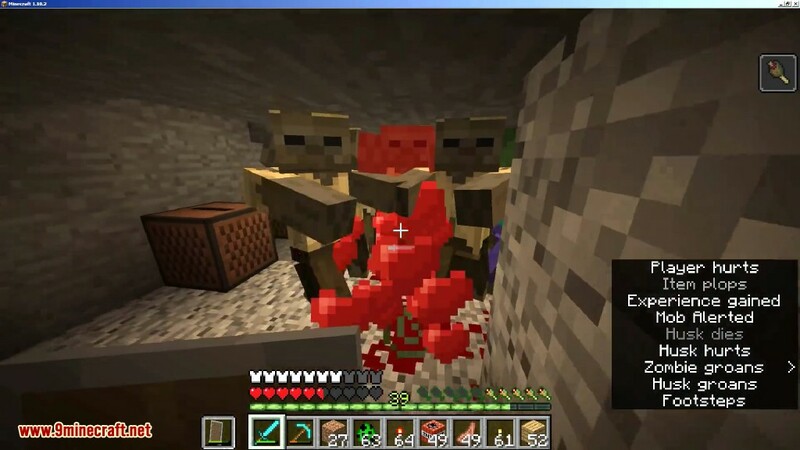 When they bleed, there will be red spots placed on the blocks around them, which hostile monsters can smell. The blood spills will slowly decay until they are completely gone. 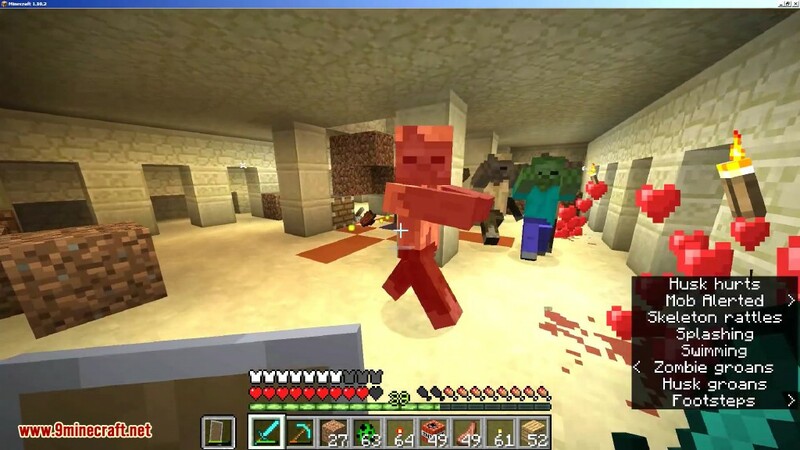 When the player is below 60% of their health, or has less than 6 hearts, they will bleed every 30 seconds, which will leave a fresh scent for monsters to smell. 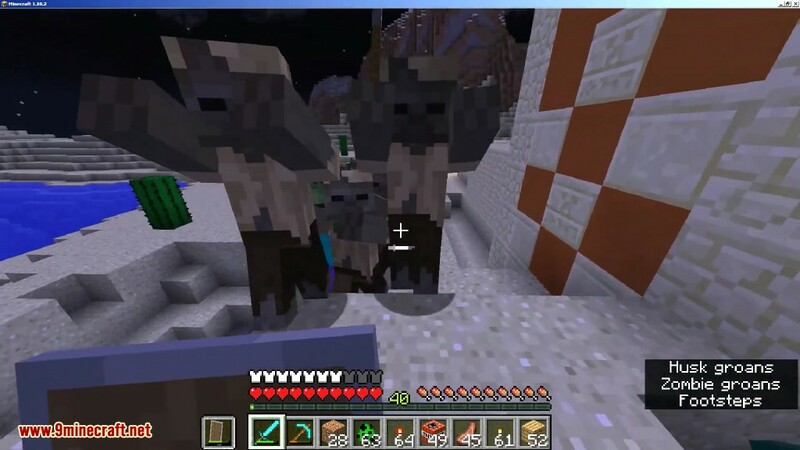 Anything that a player does, such as mining, placing blocks, walking, and other various activities that create sounds can alert hostile monsters within about 16 blocks. They can then find the player making the noise. Frequent noises are able to be heard farther away than non-frequent noises. 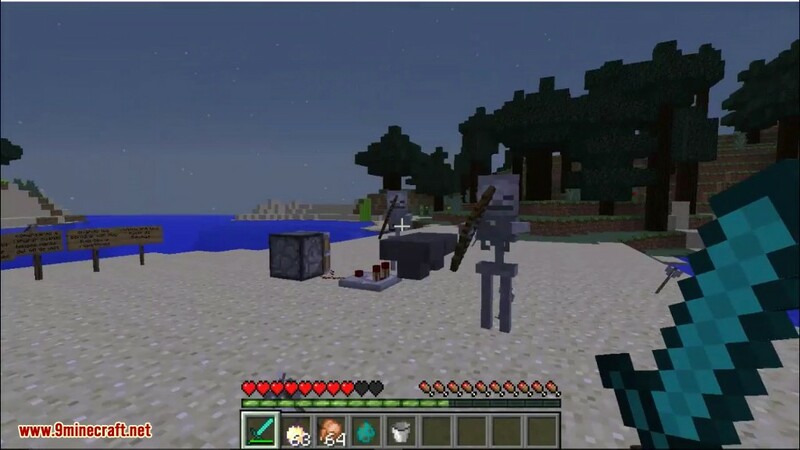 Hostile monsters will be able to spot light sources from a greater distance, and will generally try to get closer to them. They will also put out placed torches if they can. 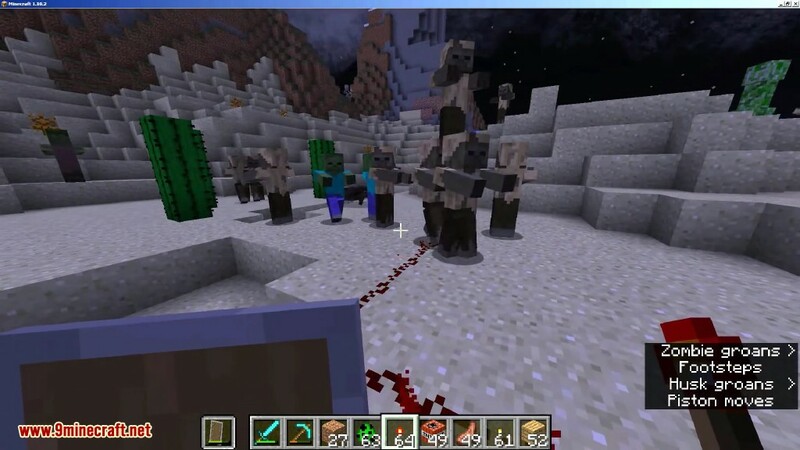 Smarter more aware zombies (and skeletons), they track you down via blood scent, sound, and light source awareness, config lets you pick and choose what features to have. 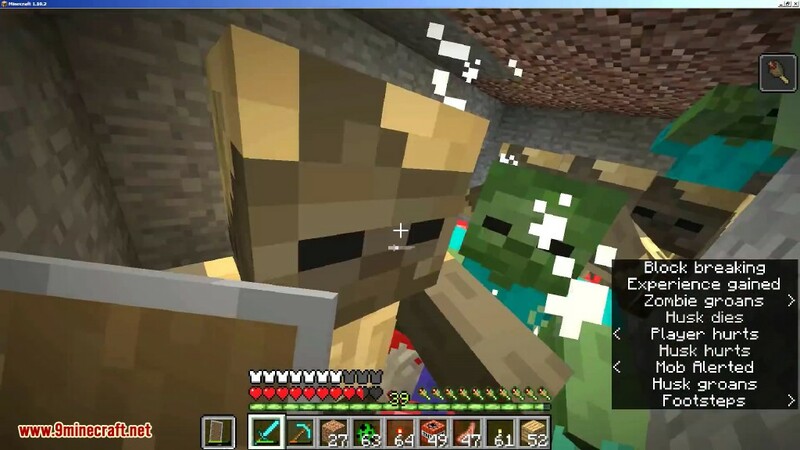 Hostile monsters have been given the ability to smell blood that the player spills, and even hear the players activities depending on how loud and frequent it is. If they sense it, they will find you. 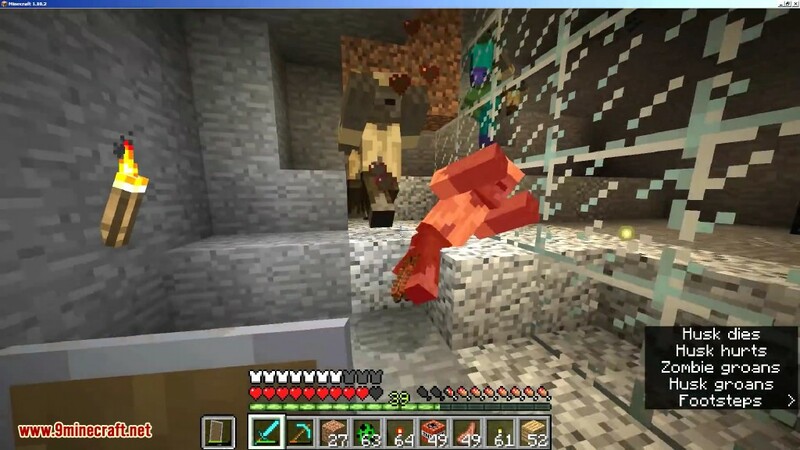 Mining in caves has a whole new challenge to it with this, be carefull not to get cornered when busy making all that noise mining those much needed materials, always plan an escape route. When Blood scents are dropped, they slowly decay in strength until gone, causing hostiles to pathfind to the stronger scents, where you might be. When the player is hurt, he spills blood onto the ground. When the player is below 60% health, he bleeds every 30 seconds leaving a fresh scent, so be sure to keep healthy. Scent usage and strength is customizable, strength defaults at 100% of a 64 block radius. When pretty much anything near the player makes a sound, there is a chance that a hostile within about 16 blocks might hear it. Sounds traces are amplified and are heard from farther away if they are very frequent. So a lot of arrows landing or fighting off a lot of monsters will attract company fairly soon, better relocate. Option for X-Ray Sight targeting. Option for Omnipotent auto player targeting. 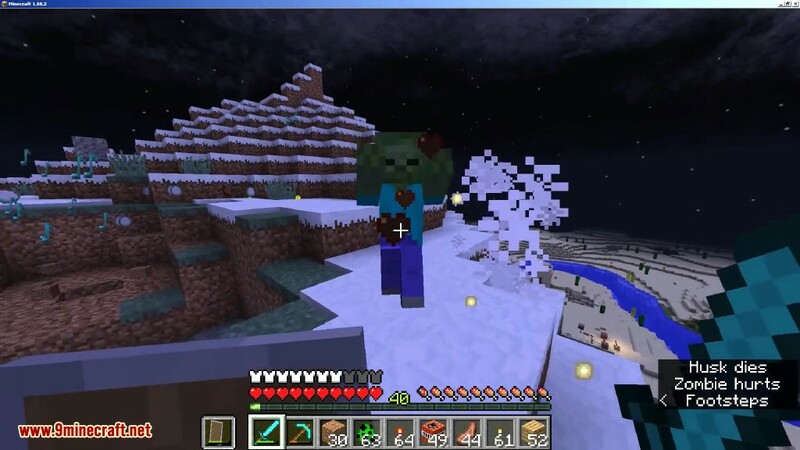 Make sure you have already installed Minecraft Forge and CoroUtil.